This entry was posted in Racing on November 9, 2008 by Steve Tilford. I wasn’t sure what to expect from myself this weekend. I’d committed to coming up to Toronto over a month back. It’s not that I”m not in OK form, it just that I’m in OK form. Whatever my thoughts were a month ago, alot has changed, so they aren’t really pertinent now. They field was pretty good, but not super deep. 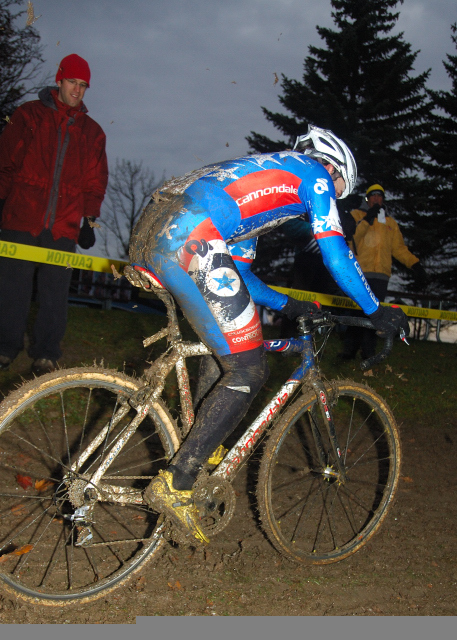 Tim Johnson and Jeremy Powers were the cream. Then Andy Jaques-Maynes, Matt Shiver, plus most of the best Canadians. And a bunch of others that have been going fast so far this season. Both courses were awesome, but completely different. Saturday’s was a pretty flat course with lots of off camber riding. And some rain came down on top of the 40 degree temperatures. That made the course pretty slick from the start. And it got slicker the whole hour. Luckily, I’m alright in the mud. But, unluckily, I wasn’t having the best pedaling day of the year. It wasn’t be any means the worst, but it could of been better. I got myself all the way up to 2nd after half a lap, but that wasn’t to be. They was a pretty long steep climb that became a run up the first lap and nearly all remaining laps. After Tim Johnson had punched out and Jeremy Powers messed around in the pits changing bikes/wheels/ whatever, then punched out, there wasn’t anyone really left to race with. Nicolas Weighall was in no-mans-land behind the CyclocrossWorld.com riders and then Andy Jaques-Manes and Matt Shiver and I riding around behind him. Molly Cameron was hanging tough for a while, but never gained much ground on us. I fell only once, hard on my right shoulder. Then I screwed up a couple times and got gapped from Andy and Matt. Finally, I decided to try to ride all the climbs instead on run, thinking I was going to be crippled for Sunday if I didn’t. That was way slower, but lots easier on the legs and back. It didn’t really pay off, I was still pretty sore Sunday morning. I ended up 6th, which is OK UCI points. 18. Nearly the same as 3rd in a UCI C2 race. Sunday was completely a different race. Up and down a small ski hill. Nearly the most climbing possible in a cyclo-x. I got a pretty miserable start. I realized that my right arm wasn’t working that well in the morning, but lifting the bike the first time over the barriers was nearly impossible. I wasn’t worried because I thought the race was going to be one of attrition and I could manage the torn rotatorcuff thing. Then it started to rain. The climb had two steep pitches in it. Both just 30 meters or less. They got so greasy that you had to climb on your seat and pedal very fluid. That’s not something I’m good at. Probably actually a better description would be that is something I’m bad at. And it showed. I was out of the top 15 the first two laps, but within striking distant of 5th still. Then, just when I started figuring out the whole situation and got going, I broke a spoke in my rear wheel. In retrospect it was a mistake, but at the time, I thought I could still ride into a good position without changing my wheel. I thought it was going to take too long and I wouldn’t have enough time to pick off enough riders. I hardly picked anyone off at all. The last two laps it started drying up enough so I could climb the hill with my pedaling ability. I started going pretty good, but I was way too far back. I caught 3 or 4 guys and ended up getting 12th. Finishing, I spun my wheel and it was hitting one side of the brakes pretty seriously. Whatever. I wasn’t really out of energy, I just couldn’t allocate the power I had properly. Tim Johnson made up for his 2nd place finish to his team mate from the day before and won handily. 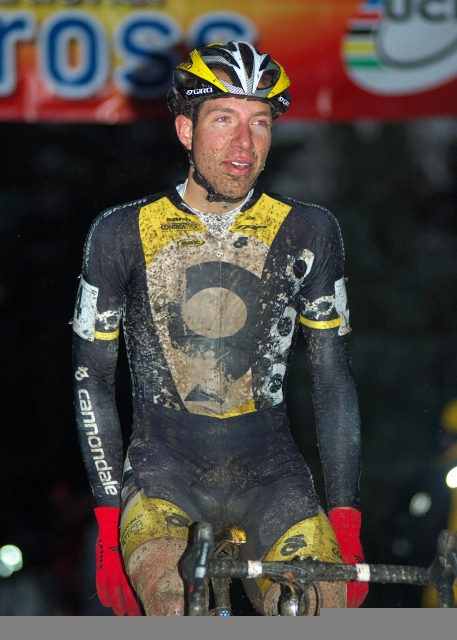 Then Jeremy Powers, Andy Jacquest-Maynes, etc. I felt pretty good today (Sunday) and am alittle disappointed that I didn’t have a better finish, but that is cycling. 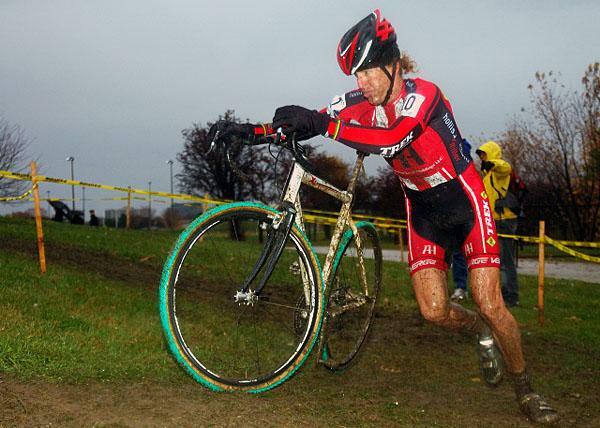 I’m thinking about going out to the East coast to the New Jersey UCI races next weekend. I need to race more. And I want to see how fast everyone else is going. Obviously Tim and Jeremy are going real fast. Ok. Monday is flying all day, so it’s a write off. Hopefully the weather in Kansas is alot better than Toronto. I’m not ready for winter just yet. Tim Johnson in the mud. Congratulations on the placing. The New York Times covered the event.